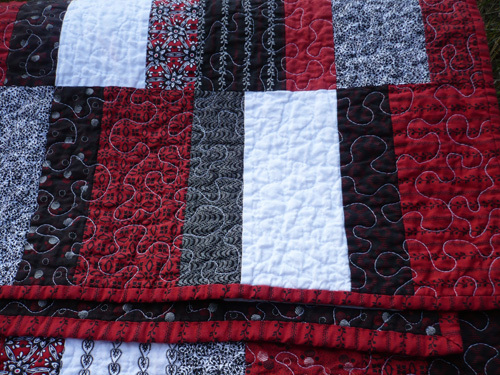 I finally finished the Black, White, & Red All Over quilt (well, I actually finished it about a month ago). 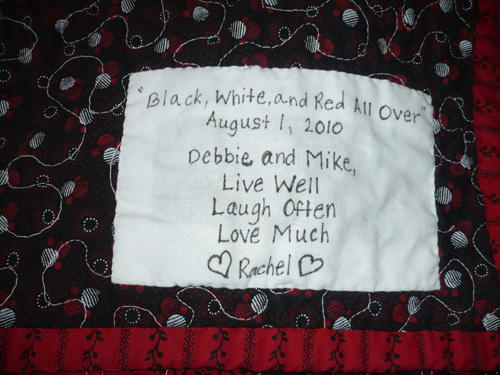 This quilt was a wedding gift to my cousin Debbie and her new hubby Mike. I can’t remember the post wash measurement, but I think it was 53 x 63ish. 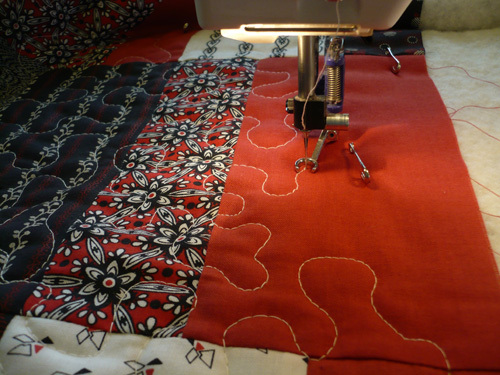 My quilting and sewing has been slow going this summer. I was hoping that once the kiddos were back in school I’d have so much more free time to sew, but that just isn’t the case. I’ve been working a lot more, and sadly there’s been little sewing going on. One of these days I’ll get back to it…hopefully very soon. Back from vacation, and while I was away I took the opportunity to bring my sewing machine in for its annual check up and cleaning. I picked up my machine today, so it’s back to sewing! This post is kind of like my to do list for the rest of the year. Ha! I hope I can get it all done. School starts on August 2, and with both of my kiddos in school this year, I foresee a lot of daytime sewing. That’ll be a nice change from all my burning the midnight oil sewing and quilting. And I really need to start and finish the Breath of Avignon quilt. 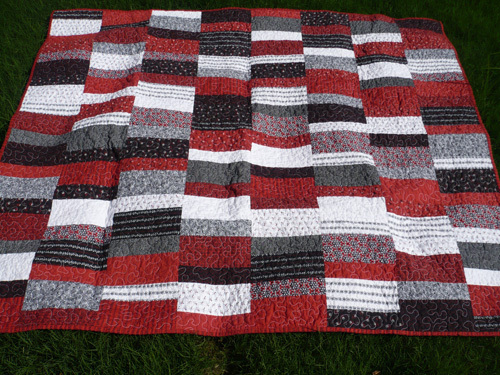 And I really want to take part in Freckled Whimsy’s charm pack quilt along. I’m using my Wee Play charm packs, but I also ordered some solid fabric today. And I have a another quilt to start and finish. This quilt’s recipient is long overdue for quilt, and since she may read this blog, I won’t divulge who or what the quilt is…yet. And a quilt using Kate Spain’s 12 Days of Christmas layer cake. And I really need to start and finish another quilt by the beginning of December. And I’m sure there will be more that come up. 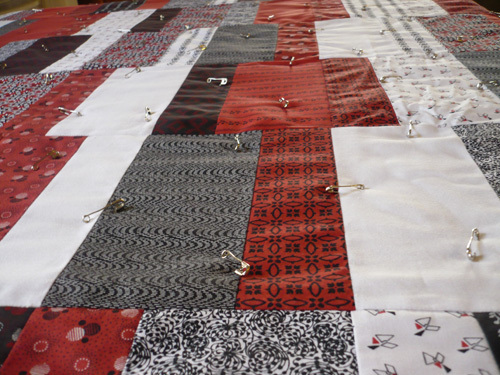 Over the weekend I put the Black, White & Red All Over sandwich together and pin basted it. Then last night I got totally stressed out when I realized we are in April and I have to finish this quilt for a summer wedding, I have to start and finish a baby quilt for a friend’s baby due in June, and I have to start and finish another quilt before the end of June. All this and I’m about to get super busy at work. 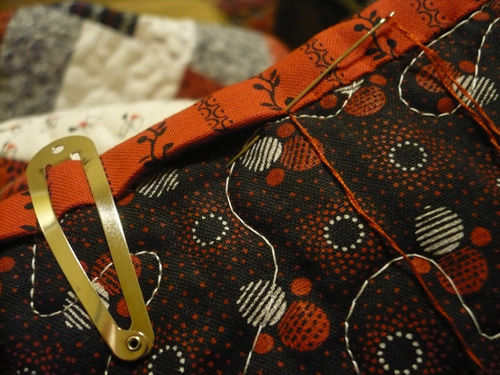 Needless to say I was a bit of a stress basket case last night, especially when I looked over at my newly pin basted Black, White & Red All Over quilt in which I used all of my pins to baste it. So now, I certainly need to quilt that quilt, so that I can have the pins handy to do the other 2 quilts that need to get completed before the Black, White & Red All Over (and I most certainly was not about to take out all those pins!!!!). Luckily today was a nice day and my daughter was outside playing with her friend, which meant I had some time to just quilt, and quilt I did! The whole quilt is now quilted, yay! 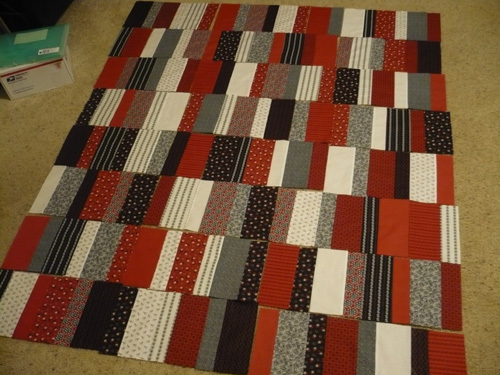 Now I’m going to put this quilt aside so I can work on the other more pressing quilts. I generally like to finish a quilt before I start another one, but I’m going to have to make an exception. The binding and label will have to wait for another day. I’ve always thought that the black, white, and red colorway was so striking. But those colors aren’t very me in the sense that I wouldn’t really make a quilt for myself with those colors, but still, I’m always drawn to quilts with those colors. So I decided to go ahead and make a quilt with these colors. I’m really loving it, although this quilt isn’t for us; however, I’m certain that the recipients will love it too. Here’s the layout. The top is sewn together, but I don’t have a picture of the quilt top. Hopefully I can get this sandwiched soon, because I’m excited to see the finished project!